2. Hsuan, K., Chin, S. C. and Tan, H. T. W. 1998. 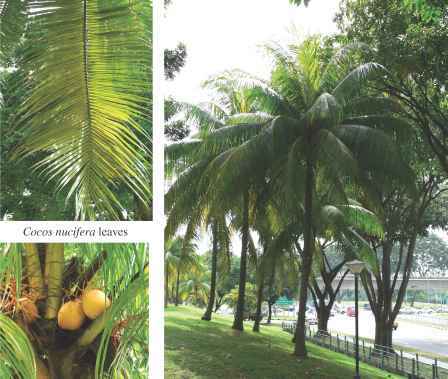 The Concise Flora of Singapore volume II: Monocotyledons. Singapore University Press: Singapore. 4. Ge, L. Y., Yong, J. W. H., Tan, S. N., Yang, X. H. and Ong, E. S. 2004. Journal of Chromatography A 48: 119-126. 5. Kooiman, P. 1971. Carbohydrate Research 20: 329-337. 6. Duke, J. A. and Ayensu, E. S. 1985. Medicinal Plants of China, volume one and two. Reference Publications, Inc.: United States of America. 7. Jain, S. K. and DeFilipps, R. A. 1991. Medicinal Plants of India, volume one and two. Reference Publications Inc.: United States of America. 8. Woodley, E. (Ed.). 1991. Medicinal plants of Papua New Guinea, part I. Veerlag Josef Margraf Scientific Books: Weikersheim. 9. Esquenazi, D., Wigg, M. D., Miranda, M. M. F. S., Rodrigues, H. M., Tostes, J. B. F., Rozental, S., da Silva, A. J. R. and Alviano, C. S. 2002. Research in Microbiology 153: 647-652. 10. Pummer, S., Heil, P., Maleck, W. and Petroianu, G. 2001. American Journal of Emergency Medicine 19: 287-289. 11. Alviano, D. S., Rodrigues, K. F., Leitäo, S. G., Rodrigues, M. L., Matheus, M. E., Fernandes, P. D., Antoniolli, A. R. and Alviano, C. S. 2004. Journal of Ethnopharmacology 92: 269-273. 12. Alanis, A. D., Calzada, F., Cervantes, J. A., Torres, J. and Ceballos, G. M. 2005. Journal of Ethnopharmacology 100: 153-157. 13. Wang, H. X. and Ng, T. B. 2005. Peptides 26: 2392-2396. 14. Namasivayam, N., Vaiyapuri, M. and Venugopal, P. M. 2004. Clinica Chimica Acta 342: 203-210. 15. Koschek, P. R., Alviano, D. S., Alviano, C. S. and Gattass, C. R. 2007. Brazilian Journal of Medical and Biological Research 40: 13391343. 16. Mantena, S. K., Jagadish, Badduri, S. R., Siripurapu, K. B. and Unnikrishnan, M. K. 2003. Nahrung 47: 126-131. 17. Mendon^a-Filho, R. R., Rodrigues, I. A., Alviano, D. S., Santos, A. L. S., Soares, R. M. A., Alviano, C. S., Lopes, A. H. C. S. and Rosa, M. D. S. S. 2004. Research in Microbiology 155: 136-143. 18. Sindurani, J. A. and Rajamohan, T. 2000. Indian Journal of Physiology and Pharmacology 44: 97-100. 19. Salil, G. and Rajamohan, T. 2001. Journal of Experimental Biology 39: 1028-1034. 20. Sandhya, V. G. and Rajamohan, T. 2006. Journal of Medicinal Food 9: 400-407. 21. Alleyne, T., Roache, S., Thomas, C. and Shirley, A. 2005. West Indian Medical Journal 54: 3-8. 22. Kirszberg, C., Esquenazi, D., Alviano, C. S. and Rumjanek, V. M. 2003. Phytotherapy Research 17: 1054-1058. 22. Calzada, F., Yepez-Mulia, L. and Tapia-Contreras, A. 2007. Journal of Ethno-pharmacology 113: 248-251. 23. Wittczak, T., Pas-Wyroslak, A. and Palczynski, C. 2005. Allergy 60: 970-971.